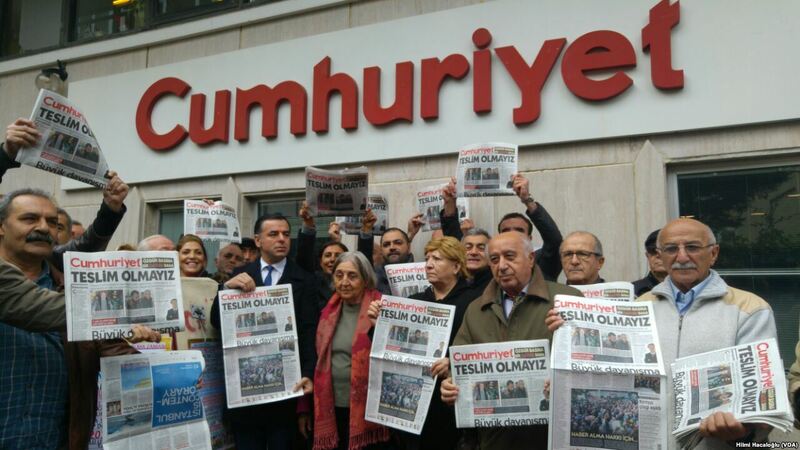 New, radical changes are affecting Turkish daily Cumhuriyet. What has shaken the historic newspaper, this time, are not the complaints filed against journalists for critical articles and statements against the Turkish political and economic establishment, but its own Kemalist "old guard", disturbed by the editorial line taken by the newspaper in the last 5 years, and which has now taken over. To date, due to the change of management, 26 journalists have resigned, including leading names such as Kadri Gürsel, Çiğdem Toker, and Özgur Mumcu. Others were fired, including Murat Sabuncu (editor of the magazine for two years, of which 17 months spent in detention), chief editors Faruk Eren and Bülent Özdoğan, and head of the Ankara office Erdem Gül. The change began on September 7th, when the new board of directors of the Cumhuriyet Foundation, owner of the newspaper, took office. This happened following a successful appeal by three former managers of the foundation and a journalist who were able to annul the result of the election of the board held in 2013. Then, the establishment of new managers leading the Foundation had given the green light to a new editorial line, especially under the guidance of editors Can Dündar – from 2015 to 2016 – and Murat Sabuncu. But the liberal form and content taken on by Cumhuriyet in recent years have created great hostility in some historical names of the newspaper, like journalist and former CHP MP Mustafa Balbay who, in 2016, had criticised the magazine for "allowing everything, including propaganda in favour of the Gülen movement and the Kurds". Another leading name of the old guard, Alev Coşkun, 83, now president of the Foundation, even testified for the prosecution in the Cumhuriyet trial. The case – currently in the appeal stage – brought to the conviction of 14 journalists, staff, and administrators for propaganda and support for Gülenist and Kurdish terrorism, with sentences ranging from 2 to 7 years in prison. Five of the defendants (Akın Atalay, Orhan Erinç, Önder Çelik, Hikmet Çetinkaya, and Bülent Utku) were part of the newspaper's old board of directors. During the hearings, the defense lawyers had also shown that an anonymous letter sent in 2016 to the office of the President of the Republic was to be attributed to Alev Coşkun himself. The letter stated that the board elected in 2013 had established "an organic connection" with the Gülen movement and the pro-Kurdish party HDP, calling for prompt intervention by the authorities on behalf of the common "patriotic" sentiment. The 2013 elections were then cancelled by the court and repeated last July, with the establishment of the new administration of the Cumhuriyet Foundation. To point out the change, the management published a note in the newspaper, stating that "the original policies of the newspaper are Atatürk's enlightening reforms" and that "Atatürk and his fundamental principles, absent from Cumhuriyet for some time, have made their final return". An important change of direction for a newspaper that in recent years had distinguished itself for investigations and articles on critical and controversial subjects. The effects on the difficult situation of the country's press will show soon.